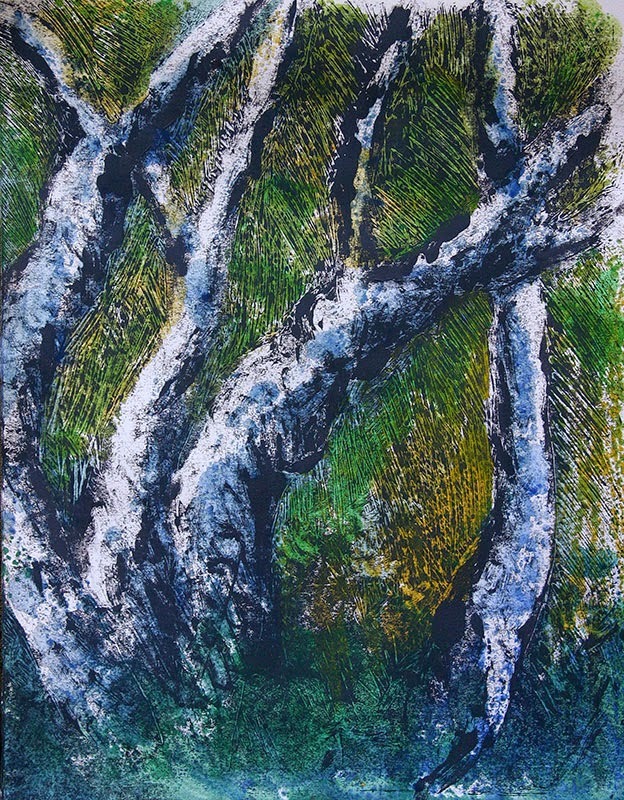 I recently started a painting of California Sycamores and found myself bored with the process and the painting. The piece may be salvageable, but only if I can overcome the disenchantment brought on by the dib-dab-dobbingly monotonous foliage that makes me yawn even as I describe it. The subject was interesting enough, but my execution was uninspired. 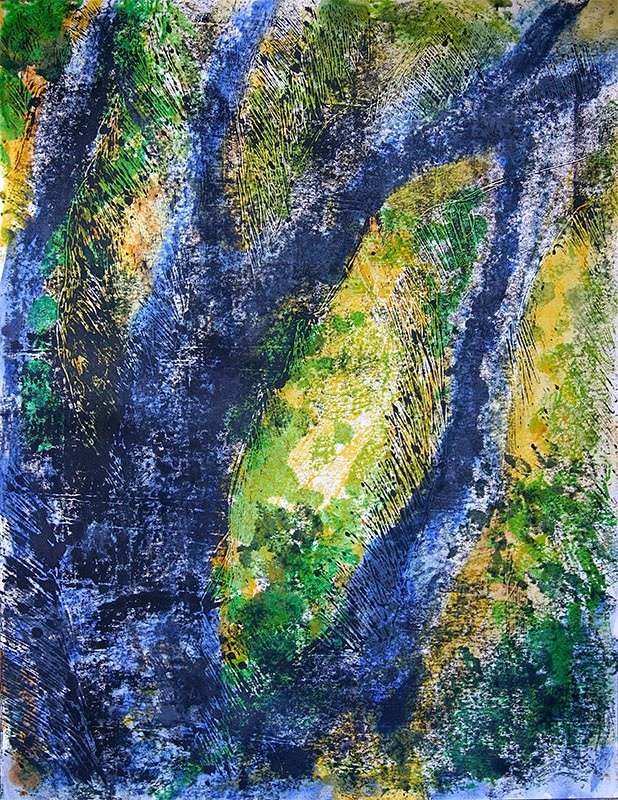 I decided it was time to return to making monotypes to revive my enthusiasm. Each time I return to monoprinting, it’s a fresh challenge. Should I wet the paper? Does the image transfer better with acrylic, watercolor, or oil paint? What brush did I use last time to scrape away the ink? If I recorded this information and kept better track of my tools, this would be a simple process. However, I confess I enjoy finding my way through the process each time in the hope that I will uncover some new technique that delights me. I created two prints using slightly different techniques. With the first, I did a rough drawing (with paint) on a Plexiglas sheet. I brushed in the background colors of the leaves lit by the sun. Then, I added some blues and grays to establish the trees. This build-up of color took several repetitions as I applied paint to the plate, flipped the paper on top, and burnished the back of the sheet to transfer the paint. Then I broke out black and gray oil colors to overprint the lighter tones. I rolled the ink onto the plate with a brayer and set to scraping away ink. I was working blindly as I'd completely covered the ghost image that remained on the plate. It was kind of a "duh" moment, but I went with it anyway, guessing where the trees were and scraping accordingly. When I peeled the paper away after the last rubbing, I really liked the texture of the ink contrasting against the layers of color. I added a bit more color here and there and voila! I hope you like it too. With the second piece, I took the reverse approach: First, I inked the plate with a mix of black and gray. I scraped away the background, then brushed out the highlights on the tree trucks. After I transferred the ink to paper, I added layers of color on top – giving me a different result: more structured than the first piece. I like them both—how about you? I love experimenting with the layering and lifting of ink and paint—this was just what I needed to break out of the doldrums of my recent art (non) adventures.